Dr. Oommen is board certified in general surgery, and focuses her practice exclusively on breast surgery in the area of benign and malignant breast diseases. She received her medical degree from Howard University College of Medicine and completed her internship and residency training in general surgery at New York Medical College-Sound Shore Program. This was followed by a fellowship in breast surgery through Cancer Institute of New Jersey, which is part of Rutgers University. 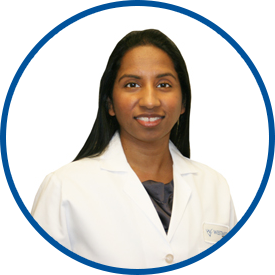 Dr. Oommen is dedicated to her patients, and believes that a multidisciplinary approach is very important in treating the patient as a whole. Her goal is to relieve any fears or misunderstandings about diagnosis and treatment, and to empower her patients to make the right decisions. She utilizes minimally invasive techniques for the diagnosis of breast cancer and breast diseases. She is a Fellow of the American College of Surgeons and a member of the American Society of Breast Surgeons. She operates at the Rye Ambulatory Surgery Center and White Plains Hospital. I really like Dr. Oommen. She does a good job of balancing the news she has to give me so I process it with the correct level of seriousness. I loved that I had an ultrasound, met with the radiologist immediately after, and then walked down the hall to my provider's office. No wait at all. Seamless care! i would like to thank Dr Oommen for giving me good advice. it definitely helps knowing what she told me. The doctor was always honest and took the time to address my concerns and fears. I really needed that. Dr Oomen was wonderful. She explained everything clearly beforehand, and every step of the way. I would definitely recommend her to anyone. *Dr. Annie Oommen is a wonderful doctor. Very caring and compassionate. Definitely made me feel less nervous regarding my surgeries. As always, MD is very friendly & professional. Good level of expertise. Dr. Oomenn is a caring professional. She has a very positive attitude and transmits a feeling of confidence to the patient.